This is the first in a series of Q&A interviews with published board game designers. The idea is to ask them all the same set of questions, so people can compare the answers and build an insight into what makes designers tick – alongside a stock of answers to questions all new designers will end up facing themselves. Matthew Dunstan is the designer of Relic Runners, co-designer of Elysium and Costa Rica (both with Brett Gilbert), and co-designer of Empire Engine (with me) – with several more games slated for 2017 and beyond. He’s an Australian from a small rural town now living in Cambridge, England, where he recently completed a PhD in Materials Chemistry and continues to work in the field. But while game design isn’t a full-time job, he already has a Kennerspiel des Jahres nomination under his belt for Elysium. For my day job, I work as a research scientist within the Chemistry department at the University of Cambridge. I am very lucky to have an understanding boss who lets me take time out for various game design related travel, so it works quite well. Outside of game design, I don’t really have any other creative pursuits – I did play both piano and saxophone earlier in my life but not so much anymore. I am getting into escape room design, but I suppose this isn’t much of a leap from regular tabletop game design! Wow, tough question! My favourite designers include Stefan Feld (favourites include Macao, Castles of Burgundy and Die Speicherstadt – I haven’t gotten to play to rethemed Jorvik yet), Antoine Bauza (7 Wonders, 7 Wonders: Duel), and Uwe Rosenberg (mainly for his 2 player games Agricola: All Creatures Big and Small, and Patchwork). But I will also include Andreas Steading and Thomas Lehmann, simply for designing Hansa Teutonica and Race for the Galaxy respectively; two of my favourite games. As for designers I most admire, this list might be even longer! But I’ll try: Uwe Rosenberg for his incredible ability to design games with so many moving pieces and his rigorous testing procedure; Vlaada Chvatil for being able to design standout games in so many different categories, from Codenames to Through the Ages; Friedmann Freese for being a true game design scientist; Rob Daviau for starting a powerful new trend in gaming through the legacy concept, and for being able to actually finish 3 (!) legacy games – that is an incredible feat; Bruno Cathala for his incredible rate and quality of output, as well as being an amazing collaborator with so many different people – an ability I value very highly; and finally Brett J. Gilbert, a long time collaborator, for his innate ability to seek out elegance in game designs. I don’t exactly remember, but I think I started out by seeing game design as a new challenge I could undertake. I enjoyed playing games, and I thought I could understand how they could work, and so I just started making games. Maybe there is something in me that likes taking hobbies and exploring a side behind them – for example I played many sports when I was younger, and chose to go quite far in becoming an umpire in tennis and hockey (I have officiated at both the Australian Open and on the same hockey ground that hosted the Sydney Olympic Games, for example) – perhaps I like being in control in these things, and where can you have more control in games than designing them? For the earlier part of my design career, I definitely was a mechanic first kind of person – for example Relic Runners started as essentially an abstract game centred around an interesting network mechanic. 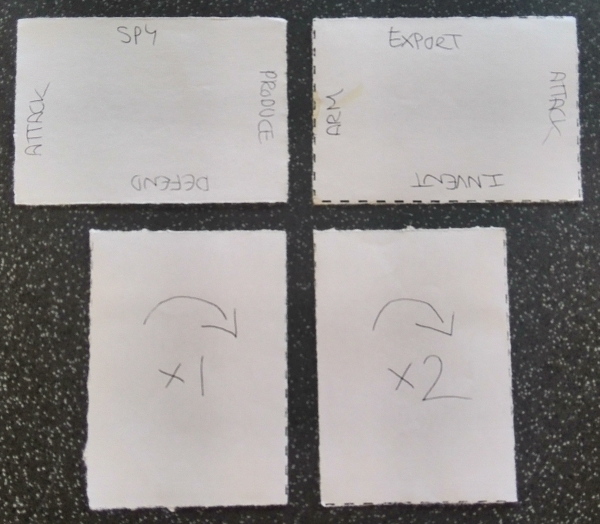 As the years go on I think I am designing more and more with a certain experience or audience in mind – is this meant to be a short family card game, or a thematic family game a la Colt Express, for example. I will always need a strong mechanical identity at the heart of my games, but I am more and more considering the entire experience at the beginning of my process. I think this is really important as publishers are much more concerned with the overall experience a game creates for its players than any particular mechanism that might be present in the game. The best aspect of game design is that very first test when a new idea finally starts to work, and you see the glimmer of what the game is actually going to become for the first time. Its a relief in some ways because now you know that what you’ve been working on for sometimes months or years is going to get there, its going to be finished. A very close second is collaborating. I really like bouncing ideas off another person when it comes to working on games, and I love how efficient it can be moving forward when you have two different heads working on the same problem. The worst aspect are the very early tests that fail, especially with ideas that you had high hopes for, and they don’t even fail in an interesting or insightful way. Failure is fine, and sometimes can lead you towards to best direction for the game, but sometimes all a test will tell you is that the current idea doesn’t work and you should go back to the drawing board. That can be exhausting sometimes. I think medium to heavy euro-style games with many interconnected pieces are the hardest games for me to design. I can think back to a lot of attempts that I have made, and often they work, but they just aren’t that fun. I haven’t come up with a good way yet of realising how to get to the fun in these types of games, despite enjoying playing them very much! Probably the other type of game is a children’s or very light family game. I just don’t have a good sense of how much ‘game’ you need for it to be enjoyable for these audiences, and as a consequence I usually put far too much into these designs making them unsuitable for the target market. Oh, and legacy games. They’re stupidly hard to do. My best tip would be to never use the computer for your first prototype – simply get some pen and paper and write and/or draw it directly. I think this helps you to do a few very important things. Firstly, you are forced to be minimal in your first design attempt – it is too difficult to write out by hand 100 or so cards with different text, and so you usually will stick to the minimum amount that you need for the first test. This will save you a lot of time, as normally you will be throwing out a good proportion of what is in that first prototype, and at least you haven’t wasted time making 100 different cards that immediately need to be scrapped. You’ll also not have wasted time working on art or layout either. Additionally, I think it removes a barrier between you and getting that game to the table for the first time. If I’m working on my computer I think there is some resistance to actually going to the trouble of printing and cutting out the cards and other components – if I just get straight into making the cards directly I can have that first prototype ready very quickly. Basically, remove anything you can that will delay you getting the first prototype to the table – that is where you will learn the most about the game, not on your computer or in your head. My worst pitching moment was when I had a meeting with a publisher whom I hadn’t met with before – they were late (which is fine), but this was due to a mix-up in our schedules (also fine). I offered to reschedule, but the publisher (who was not in a particularly good mood) wanted to do the meeting then and there. I pitched one game quickly, and they were interested, but somewhat aggressively wanted 6 months exclusivity to evaluate the prototype. I decided to not leave the prototype with them, and left the meeting feeling the most down I have ever been in a meeting in this industry. It might not have been a particularly bad meeting, but I think its more in comparison to the many many wonderful meetings I’ve had with editors and publishers, some of whom I would count as friends now. To be honest, the majority of my pitching experiences have been very positive, and I think one or two meetings like this are inevitable – and understandable given the pressure publishers are under during conventions! My best game design moment would be a tie – one was going to the Spiel des Jahres ceremony in Berlin when Brett and I were nominated for the Kennerspiel des Jahres for Elysium – it was just such a spectacle, with the press and ceremony, and it was a lot of fun meeting everyone involved in this process. The second moment would be at Essen in 2013 when Relic Runners was released – it was my first game, and there it is, splashed all across the Days of Wonder booth, with 5-6 tables playing the game. It was incredibly satisfying and rewarding, and I was so lucky to work with such an amazing publisher for my first game! Probably my favourite style of game that I enjoy playing are special power card games – games like Race for the Galaxy, Elysium (yes, I enjoy playing my own games! ), Abyss, Imperial Settlers, Macao, Dominion, and of course Magic: The Gathering. I just love the myriad possibilities for how cards can combine with others to form emergent systems and strategies, and every game is different. The other style I really enjoy are euro-style game with a spatial element that aren’t war or majority-style games (well, at least where this isn’t the sole focus). Examples of these that I really enjoy include Hansa Teutonica (which has the finest mechanism for euro-style player interaction that I have every seen or played), Five Tribes, Endeavour and Blue Moon City. Again, they offer so much variation with just small ways in which the board is arranged, and allow for a very satisfying feeling as you work out how best to manipulate the changing geography. I think the main thing is to be vigilant and continually improving how welcoming and inclusive the tabletop hobby is – from standing up for any members that are the subject of sexism, racism or other similar treatment, to ensuring that these under-represented groups increase their presence in the design and illustration of games (both working in the industry, and being featured in the games themselves). I would love for the game designing community to continue to welcome people from all different backgrounds – I have found it to be a very warm and welcoming community, and I hope that as many people as possible can experience that. I am a massive, massive fan of Eurovision (I am listening to some of the old songs now), and hold a massive party every year to watch it (which started even back when I was living in Australia). One day I would love to start a Ludovision competition on BGG, where each country can enter one game each year, and then we can vote on who we want to be the winner – although I don’t know if there are enough Eurovision fans to support such an idea! A massive thanks to Matt for supplying such great and detailed answers. To find out more about his current and upcoming games, keep an eye on Board Game Geek.